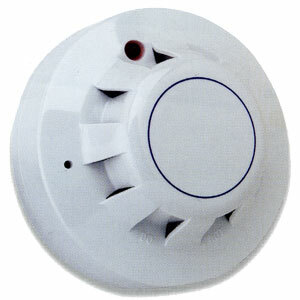 Apollo Series 65 Integrating Ionisation Smoke Detector. An integrating ionisation detector, suitable for use in areas where transient high levels of smoke may be expected. The sensing part of the detector consists of two chambers - an open, outer chamber and a semi-sealed reference chamber within. Mounted in the reference chamber is a low activity radioactive foil of Americium 241 which enables current to flow between the inner and outer chambers when the detector is powered up. As smoke enters the detector, it causes a reduction of the current flow in the outer chamber and hence an increase in voltage measured at the junction between the two chambers. The voltage increase is monitored by the electronic circuitry which triggers the detector into the alarm state at a preset threshold. An externally visible red LED lights up when the detector changes to alarm state.